Inspired by 18th-century dinnerware created for Catherine the Great, Prairie Flowers reveals an elegant border pattern of Polished Gold accents. The delicately refined design wraps around a one-piece Gabrielle toilet, which features a chair-like height and elongated bowl for comfortable, easy use. A 1.28-gallon high-efficiency flush provides significant water savings of up to 16,500 gallons per year, compared to a 3.5-gallon toilet, without sacrificing performance. Inspired by elegant architecture and crown molding, this Memoirs collection toilet with Classic design delivers functionality and water savings-as well as traditional style. A high-efficiency 1.28-gallon flush offers up to 16,500 gallons of water savings per year (versus a 3.5-gallon toilet) without sacrificing performance. The included seat, positioned at chair height for your comfort, features technology for noiseless closing and easy cleaning. Inspired by elegant architecture and featuring crisp lines, this Memoirs collection toilet with Stately design delivers functionality and water savings-as well as traditional style. A high-efficiency 1.28-gallon flush offers up to 16,500 gallons of water savings per year (versus a 3.5-gallon toilet) without sacrificing performance. The included seat, positioned at chair height for your comfort, features technology for noiseless closing and easy cleaning. 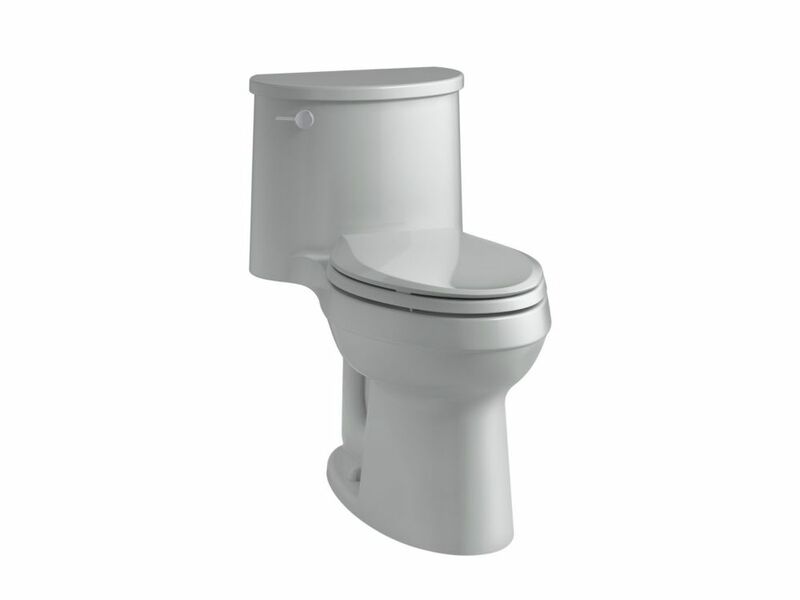 Adair Comfort Height 1-Piece 1.28 Gpf Single Flush Elongated Toilet In Ice Grey An excellent value, the Adair toilet features a striking organic design inspired by the windswept rock formations of Sedona, Arizona. A slim tank and pared-down oval forms make this compact, high-efficiency toilet perfect for smaller spaces. A 1.28-gallon flush provides significant water savings of up to 16,500 gallons per year, compared to a 3.5-gallon toilet, without sacrificing performance.